“To have a healthy old age you must act now, whether you are 30 or 50. I have two great passions – sharing my love of cooking delicious simple food and improving the health and nutrition of older people. I hope this cookbook does both but it’s not for old people, it’s for you. Maggie Beer and Professor Ralph Martins have teamed up to fight one of the most debilitating diseases of our later years. Based on the latest scientific research, Maggie has created more than 200 recipes that help provide the nutrients we need for optimum brain health. More than one million Australians are affected every day by Alzheimer’s or its impact on their family but the good news is that you can eat well to age well, from this moment on. 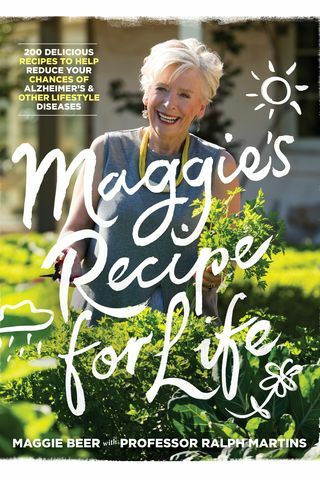 The proceeds from Maggie’s Recipe for Life will be shared between the Maggie Beer Foundation and the Lions Alzheimer’s Research Foundation.